Anyone have any experience with these caps? Can you actually see the mechanical bits move in the interior if you put a strong light behind one side of the cap and peer in? I have one in my hand and I cannot detect any movement inside upon turning the pattern selector. I know they need to be serviced every now and again but my understanding is that there are shutters that alter the pattern pickup around the diaphram. Shaggy, I've used these capsules for 35 years now and am quite fond of them. As far as their transparency is concerned, however, that is more sonic than visual. You can see some motion behind the diaphragm as you change the pattern, but not enough to make it clear what the mechanism is doing. I wouldn't exactly call them "shutters" except in the sense that they shut something. For the omni setting, the backplate is sealed completely with a synthetic rubber gasket; this makes the capsule a pure pressure transducer. For the figure-8 setting the gasket is withdrawn from the backplate so that the membrane is in a completely symmetrical situation physically, with both sides equally exposed to the sound field. For the cardioid setting, the backplate is open only through an acoustical delay line which creates reinforcement for sound arriving from the front and cancellation for sound arriving from the rear. There was a patent by Dr. Schoeps and his chief engineer Dr. Küsters on this design, which has since expired. The U.S. version of it is number 3,190,972; you can download it for free from the U.S. Patent and Trademark Office's Web site; as a teaser I'm attaching relatively low-res JPGs of the drawings from this patent, without the explanatory text. Of course in the MK 6, the capsule elements shown in the drawing here are facing forward when they're mounted upright. Schoeps used to confound the public at trade shows (such as the AES) with a very large working scale model of this capsule, in which you could see all the moving parts. I mean that it was working only in the sense that the mechanism was an analog of the MK 6's mechanism; I would doubt that it had such good frequency or polar response. Thanks, very interesting! The Schoeps team have done some remarkable engineering. I was looking at the housing which is very bombproof, very different from the mkXv series or mk8. I am not sure what I should do with this cap as far as servicing, it is an old one (hand written model and serial nos.). The selector switch is a bit tight in spots when rotating. The selector wheel does seem to line up; as the the pattern icon on the wheel and arrow on the body of the capsule line up it does so with a reassuring 'click'. Received a mk8 from Skilander and ran them both against each other along with a mk41 as the mid channel. They sounded pretty similar, the mk6 maybe a tad thinner. It seems to do what it is supposed to be doing in figure 8 mode with regards to image (I am running a vms02ib and listening with headphones to the M/S mix or II on the toggle switch above the headphone jack). I ran the cap as a omni, and it behaves like an omni....but I am not quite sure. It really doesn't matter, I want to run it primarily in figure 8. If it is run like a cardioid, there are two places on the selection wheel for that setting. Does it mean the 0 degrees will be opposite of each other depending on which cardiod setting? Also, looking at the polar patterns on the Schoeps site, it seems that the fig 8 pattern is not symmetrical in the much higher freq range. Is this the case with all figure 8 or the Schoeps mk6? Shaggy, the housing of the MK 8 was revised about ten years ago to leave somewhat wider spacing between the slats. Too much "bombproof"-ness can restrict the low-frequency response of a capsule at times, as it turns out. With Schoeps capsules, since no one else does repair work on them (or should do so, at least), it's very easy to find out when it was at the factory last--you can send a note to mailbox@schoeps.de including the serial number of your capsule, and they can look it up for you. If your MK 6 is one of the early Colette models then I would recommend sending it back via Redding Audio in Connecticut. In fact if it's been more than 15 years since it was serviced (which would include many capsules that aren't among the very earliest), I'd recommend it. The clearest symptom of trouble in an older three-pattern capsule is if the omni pattern isn't so omni any more. In a microphone that needs the gaskets replaced, the figure-8 position nearly always works the best of the three patterns, unless the mechanism itself is broken. By the way, these older capsules should always be stored in the figure-8 setting, which often allows the gasket material to spring back somewhat. But best of all is to have the capsule serviced--they've got a new type of synthetic rubber now which lasts a lot longer. The two cardioid settings are identical--there's no difference in which way things face. The polar response of the figure-8 setting is in fact highly symmetrical--but keep in mind that 16 kHz, which is one of the standard "spot" frequencies for polar diagrams, is the very limit of this capsule's response. The pressure gradient is just too small at such short wavelengths to move the membrane with as much force as it has at lower frequencies, and there's no pressure response to compensate (as a cardioid or supercardioid would have). So the response rolls off at that point in the figure-8 setting. But the pattern remains basically that of a figure-8, unlike some other microphones in which it narrows considerably or else takes on strange shapes with abrupt peaks and dips in the response. Interesting. I would have liked to have seen this. Exactly how big was the prototype? If it is purely mechanical, can the selection wheel dialed between omni and card to yield a subcard? If so, what is the resulting pattern of a setting inbetween card and fig-8? I am going to dump the mk8. Running Blumlein with these two different caps will not be ideal, I suspect. If your MK 6 is one of the early Colette models then I would recommend sending it back via Redding Audio in Connecticut. In fact if it's been more than 15 years since it was serviced (which would include many capsules that aren't among the very earliest), I'd recommend it. Redding ends up shipping it to Germany, right? I am in Tokyo. I sent Mr Vollmer an email asking if I could ship it directly to them for servicing since I have problems in the past communicating with their distributor/service contractor here in Japan, Imai. He said, "no problem", I just need to wire funds to them as this is the only way they accept payment from overseas. I can't read the serial number, I hope this isn't a problem! Patrick, as I recall it was about two feet tall. They still have it at the factory, but they don't drag it out for shows any more. If you make a coincident arrangement with an omni capsule and a figure-8 capsule both facing the same direction, you can mix their outputs to get any first-order pattern you like. Cardioid = equal amounts of both; wide cardioid = more omni than figure-8; super- or hypercardioid = more figure-8 than omni. That's the basis of the Schoeps "PolarFlex" stereo recording system. 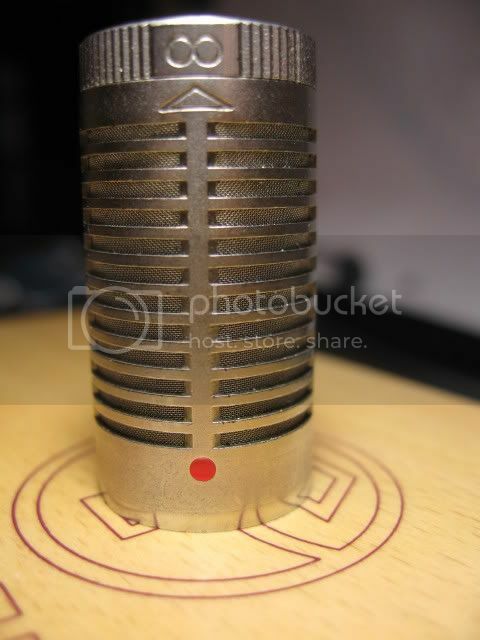 At one time in the early 1950s Schoeps had a type of two-pattern switchable-pattern microphone that worked on that principle, the M 201 (see attached photos)--it had an omni capsule and a figure-8 capsule housed together in the same capsule head, so in omni mode it was a pure pressure transducer, as is also true of Schoeps' single-membrane two- and three-pattern capsules today. By the way, the second brochure attached to this message shows the M 201 and another manufacturer's two-pattern microphone which Telefunken was also distributing at the time. The M 201 was somewhat the higher-end offering of the two, though the U 47 was certainly no slouch--$490 vs. $390 back in 1953-4. In "constant dollars" those prices would correspond today to about $4,000 and $3,150 respectively. If it is purely mechanical, can the selection wheel dialed between omni and card to yield a subcard? I tried looking it up and can't find the topic but someone here did try that and said the results sounded like booo-tay! Please see the attached screen shot of the MK 5 page from the new catalog. So, I did see the mechanism move while I turned the selector dial, it is a very subtle movement of a wire support (oriented up/down)moving towards and away from the diaphram. There is a definite pattern change; still unsure how 'omni' the omni position actually is. The cardiod is pattern seems like it should. Interesting read. +Ts Carry on..
Great info David. Any idea when Schoeps changed the gasket material they used in the MK6? I am fairly sure that it was during the 1990s. Page created in 0.179 seconds with 38 queries.